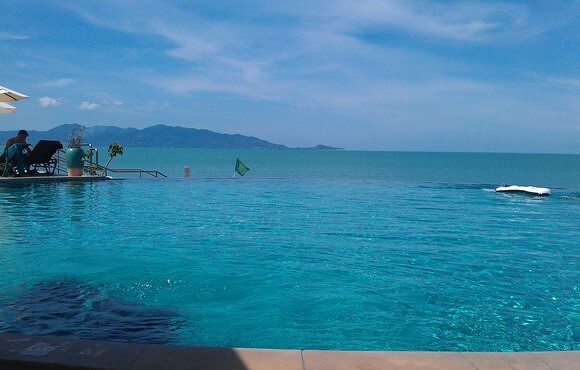 Dive Point is one of the original dive operations in Samui, established in 1996 after realizing the unique beauty of the island and it’s surroundings. While Samui has seen many changes, we hold our love for the mountainous landscape, sandy beaches, seas, and now the national marine parks around it. We value enjoyment and relaxation, as well as the excitement of discovering and sharing new experiences, sights and locations. 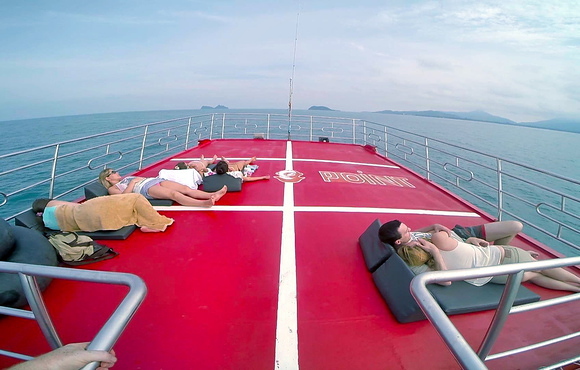 We have the most relaxed boat on Samui. Not a speedboat, but a 27 metre, 90 foot Malaysian cruiser. 3 decks to relax. Skilled Thai Captain and a Thai chef who cooks fresh food daily in the galley from produce bought that morning in the markets. So you enjoy fresh – not served from coolers – authentic food. Diving or snorkeling in the national parks makes for a long day out – sailing at 8am and returning around 4 or 5pm – so do it in comfort and chill with food and drinks, sunbathe on the top deck, read in the shade on the lower decks, meet new friends and share experiences. You are on holiday, so enjoy the space and relax. 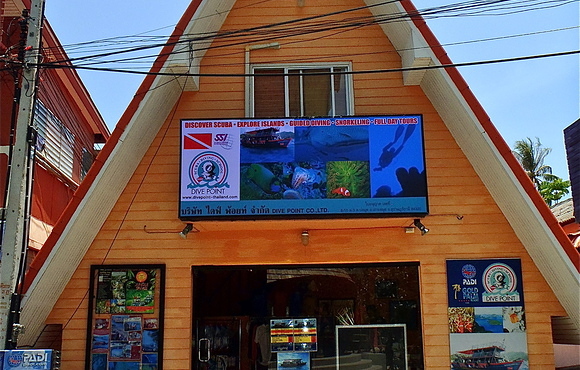 Dive Point Samui is the only SSI accredited dive centre on Koh Samui. 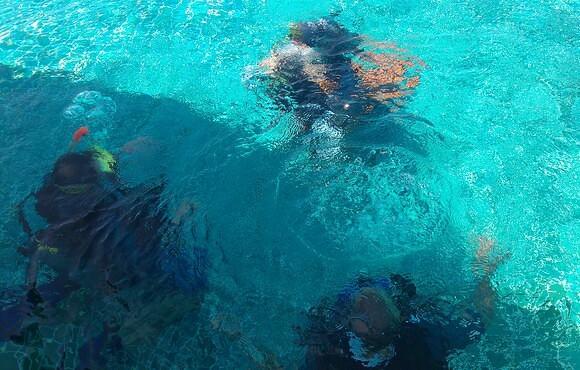 We offer both PADI & SSI courses, training and development, having dual officially certified instructors to recognize the global preferences. 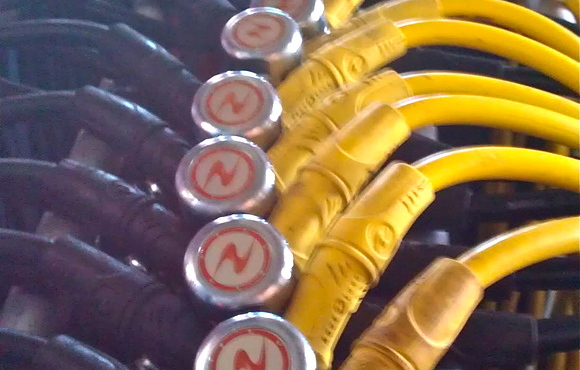 Feel free to ask us about starting or continuing your diving experience levels with us. 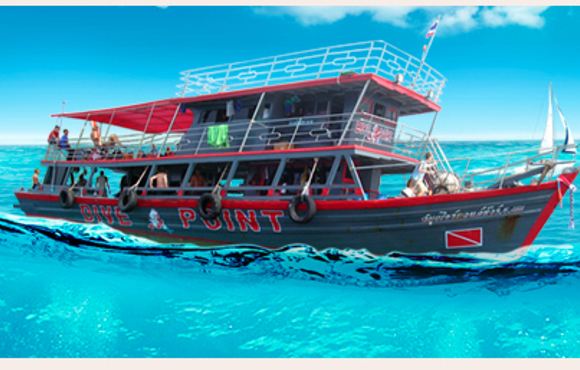 I thoroughly reccomend anyone who is interested to join dive point on one of their wonderful trips. I was very impressed with their service from beginning to end. The boat is amazing, the equipment is top notch, and the staff very professional. Thanks a lot to the whole team! Dive Point is something you just need to experience! Boat is awesome; chilled, spacious and loaded with positive energy! Staff is great and always there for you! This summer (July 2014) my boyfriend and I had an amazing experience with this firm that we would like to share. It was a blessing in disguise that we became acquainted with this company. 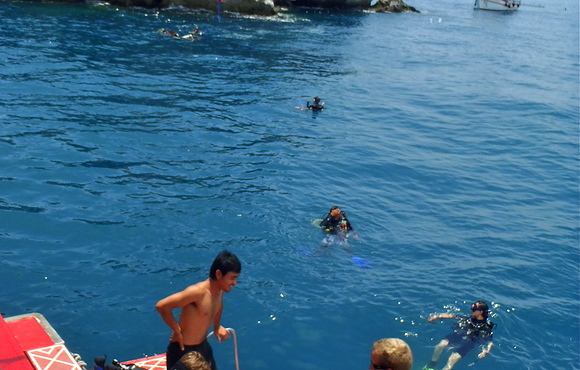 We had originally booked the trip with Easy Divers, but they cancelled at the last minute. 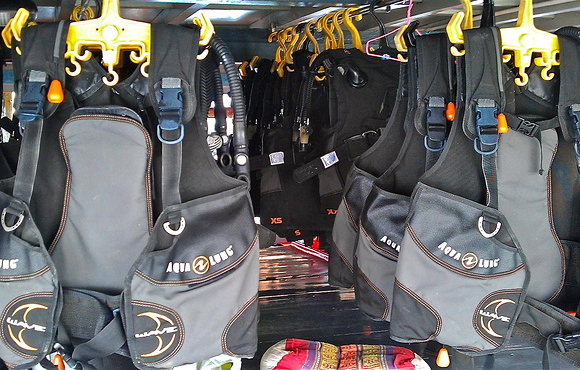 The crew from Dive Point Samui was ready to teach us instead, and we are pleased that we ended up here. We were picked up from our hotel early in the morning and brought to the boat by a nice taxi. We were pleasantly surprised when we saw that the boat was big (three decks), because it is an advantage if you easily suffer from seasickness (like I do). The crew on the boat were all very lovely and there was a cosy atmosphere. We were offered free breakfast with coffee or tea (and a seasickness pill). We were introduced to our own instructor after the morning session. Paul was our instructor and he was absolutely perfect! We learned the theory directly from Paul on our way to Sail Rock. He is clever and a good teacher. We felt ready to dive, because he made it easy to understand how to do it. We received all our pool-training exercises at the sea. It was an amazing day with three dives down to 12 meters. The kitchen made good free lunch. There was also free water available during the entire trip. It was possible to buy soft drinks and beer, which was nice (alcohol after diving). We were able to buy (cheep) beautiful pictures from our first diving experience - and we saw a whale shark at Sail Rock. We were offered an extra day for free, even though, we had already received our certificate. This was a sweet gesture by Fiona, which we appreciated. 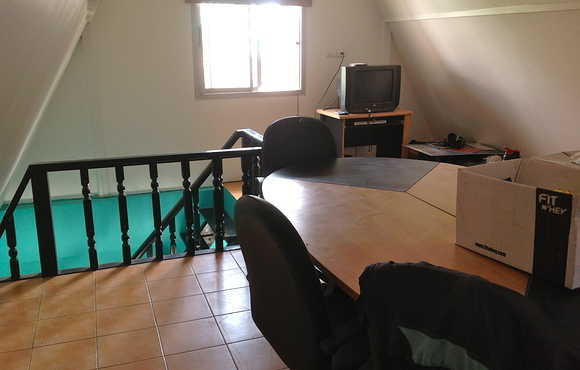 It was a good compensation for the mistake due to Easy Divers – although it is a different company. The next day was just as wonderful – lovely people, beautiful surroundings, good education, cosy boat and nice food. Unfortunately, I had a problem with my ear. So I had to stop this dive early. Paul was very attentive and helped me. He made sure that I got back on the boat quickly. The whole crew was very professional. Fiona and Paul both contacted me after my holiday, because they would like to make sure that I was all right again. 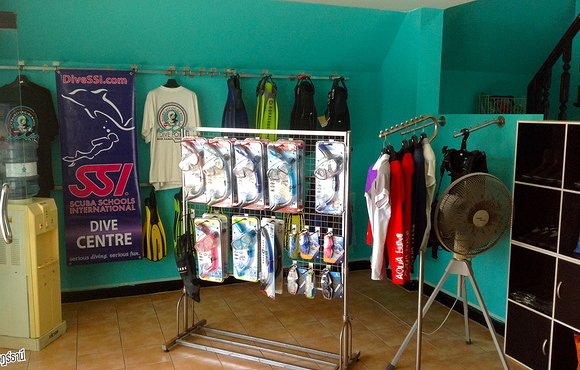 DIVE POINT SAMUI is absolutely amazing… We would like to upgrade to Open Water divers at some time in the future and we have no doubt – we will return to this company every time. Jeg skrev denne anmeldelse på engelsk, eftersom jeg var så tilfreds med firmaet, at jeg synes flere skulle kunne læse det. Dette firma er over alle forventninger, og det føles som om, at man bliver indviet i deres ”dykker familie”, når man tilbringer dagen med dem. Jeg kan ikke skrive noget dårligt, eftersom alting var i top! Dive Point Samui er helt fantastisk, men jeg vil især påpege, at vores instruktør Paul var enestående!